Country home driveway landscaping is an important part of your home and property presentation. The driveway gives guests and neighbors a first impression of your home. Your driveway is used every day, and it is nice when it looks beautiful and taken care of. In addition to looking good, your driveway design needs to be durable, functional and comfortable to drive on. A well-designed country home driveway design blends harmoniously with the surrounding landscape and highlight your house design and its architectural style, improving your home front appeal. The right width and layout of your driveway impact on how accessible your home is and how welcoming it feels, adding more beauty to your front yard decorating or home staging for sale. There are a variety of country home driveway landscaping ideas and layout designs, depending on your needs and preferences, your budget and design goals. The asphalt, stone, concrete slabs or gravel are hard materials for your driveway that are durable enough to resist tire marks, oil drips and deicing chemicals. Adding driveway accessories, gates and lighting, and attractive landscaping make your country home driveway safer and more appealing. 1. Consider the three most common driveway layouts: straight, circular and curved. 2. The four main considerations when determining the placement of your driveway: safety, access, drainage and aesthetics. Check out other design ideas or keep reading and find more inspiring pictures below. 3. Make your driveway wide enough to ensure easy accessibility and functionality of your driveway landscaping ideas. 4. Think how the look you are going for influences what materials you select for your driveway, landscaping ideas and your budget. 5. Consider eco friendly driveway design and landscaping ideas. Gravel and asphalt driveways, made of recycled asphalt, are green choices for your country home driveway. 6. Think of accenting a driveway with decorative borders, bands and aprons made of flagstone, pavers, or brick. Decide what plants and flowers you want to have along the driveway edges. Select landscape plants for bordering a driveway, according with your climate, long or short driveway design and budget. Select heat-resistant shrubs and trees for planting alongside a driveway. 7. Add lighting to your driveway, optimizing its safety at night. Select the gate style and material that compliment your landscaping ideas. A driveway is a great way to welcome guests and direct their focus to your home. 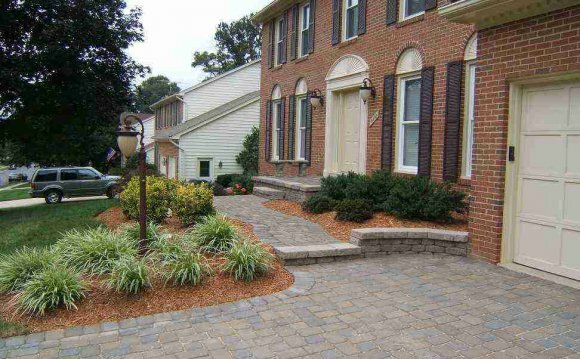 Well designed driveway landscaping ideas help show the beauty of your property, putting the house on display. Simple and natural, comfortable and functional driveway designs organically incorporate charming sweeping curves and soft slopes into your property landscaping ideas that add interest to the overall look of your home and front yard.